More than 60 intensive and high quality workshops during the Free Spirit Festival will give you the opportunity to develop your dance skills. Our teachers give workshops worldwide in different styles. 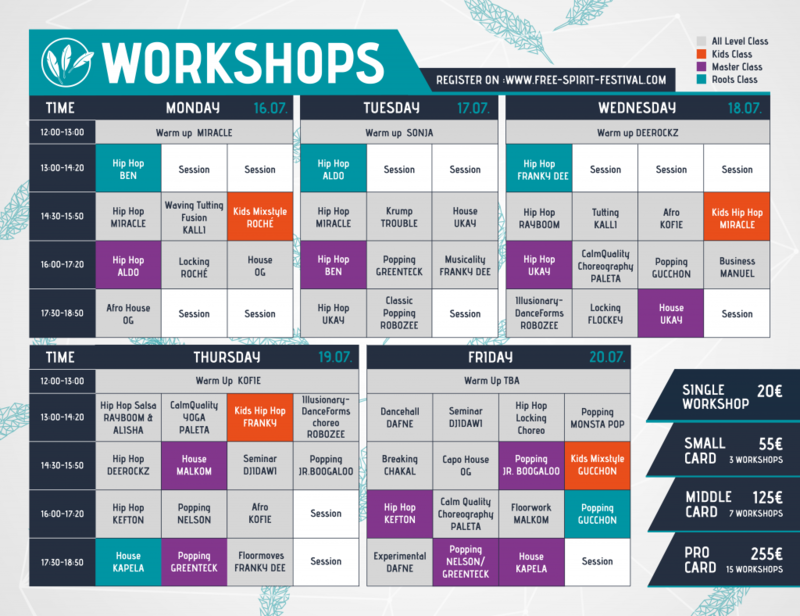 Therefore you can create your own workshop schedule. It doesn´t matter if you are beginner or professional – There is something for everybody: Hip Hop, House, Popping, Locking, Dancehall, B-Boying, Krump, and Choreography. Masterclass: You are already professional in this style and you love to be challenged? Then this is your place to be! Roots Class: The Teacher is going to explain his personal story and foundation: How to create your own base to work from. It’s not just for beginners but everyone who is interested in making the roots of his dance stronger.